Euro bulls should perhaps only raise two cheers for the wide spread up bar posted on yesterday’s daily euro vs dollar chart for several reasons. 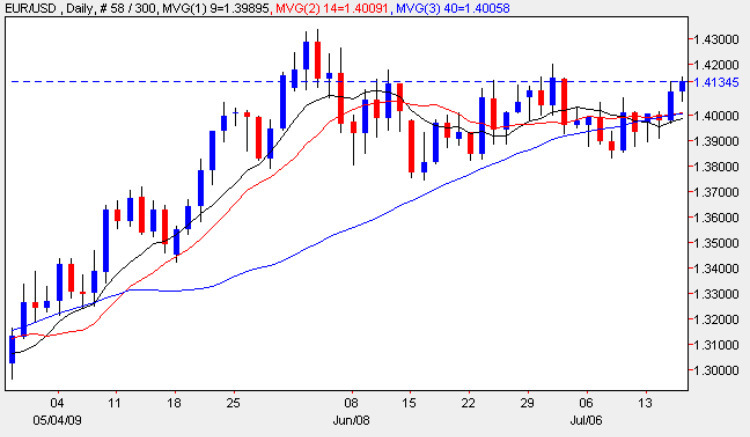 First the high of the day failed to clear the interim resistance at 1.4150 falling back in later trading and secondly only a break and hold above the 1.43 price handle will confirm whether this is a true breakout or merely a “fakeout”. Yesterday’s bullish momentum has continued in early trading capitalizing on better than expected fundamental news on the economic calendar for the US, including today’s weekly unemployment which have come in better than expected at 522k against a forecast of 550k thereby bolstering investor risk appetite. This appetite for risk will be tested later today when the likes of Google and IBM post their quarterly results – thus far the Goldman Sachs numbers are not really considered representative as they are not a bellwether stock. With thin news items of fundamental news in Europe the main items are in the US as we now await the TIC Long Purchases Data, followed by the Philly Fed Manufacturing Index. If all of these come in better than expected and equity markets rally then the Euro bulls may be able to give three cheers! !